Manhattan District Attorney Cyrus Vance&apos;s office last January announced it had reached a $10 million deferred prosecution settlement with Siemens Electrical LLC for the company&apos;s submitting false paperwork to overstate the amount of work done by M/WBEs on city jobs including the Wards Island Pollution Control Plant and the Croton Plant. In recent years, the federal government has pocketed millions in settlements from companies breaking M/WBE or DBE (Disadvantaged Business Enterprise) rules across the country. On projects in New York, Schiavone Construction settled for $20 million in 2010 for fraud related to work on the Croton Water Filtration Plant in the Bronx and Skanska settled for $19.6 million in 2011 for fraud related to work on the Fulton Street Transit Center, the World Trade Center Transportation Hub and John F. Kennedy International Airport terminal projects. According to an October article in The New York Times, federal and state investigators are now going after DCM Erectors Inc., a company that has done more than $1 billion in work on the World Trade Center, for breaking minority- and women-owned business rules. Though it pales in comparison, the City of New York is getting into the enforcement game as well. On January 14, the Manhattan District Attorney’s Office announced it had reached a $10 million deferred prosecution settlement with Siemens Electrical LLC. Siemens submitted false paperwork to overstate the amount of work done by M/WBEs on city jobs including the Wards Island Pollution Control Plant and the Croton Plant. It also lied about having a master electrician on site at these jobs, as is required by the New York City Electrical Code. 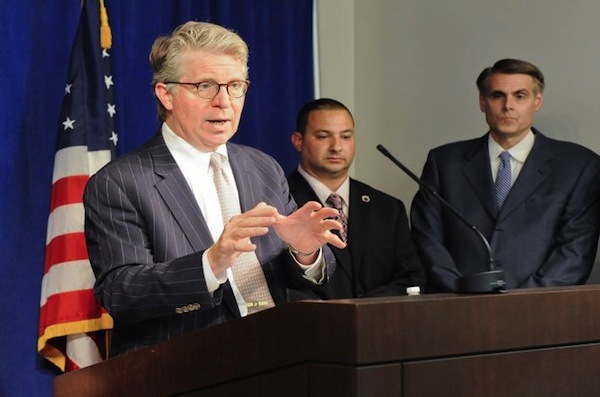 The settlement was the first big hit for the Manhattan DA, which has been conducting “a sweeping investigation of the minority business industry,” according to caution documents, records maintained by MOCS of misdeeds committed by companies that do business with the city. Many of the news stories on these frauds have included quotes from unnamed construction industry insiders saying the settlements are simply a cost of doing business. Lawyers who represent companies that have been investigated for M/WBE requirements, on the other hand, argue the settlements are easy moneymakers for governments because companies faced with a voided contract and a ban from future government contracts have no choice but to pony up $10 million or $20 million for a settlement. Meanwhile, there is still no telling how many fronts or “pass-throughs” there are doing work that has been counted toward the city’s M/WBE goals. Many certified business owners interviewed think fraud is rampant. Leon Baptiste, owner of LB Electric Co., which has worked on big government projects in New York and New Jersey, says he doesn’t want to name names but he’s seen fake M/WBE companies get city work. He certified his New Jersey-based company in 2010 and says when he started to bid on New York City projects, he was surprised by the lack of monitoring. Baptiste says prime contractors are not going to follow M/WBE participation rules if agencies are not holding the companies accountable. When it comes to certification, the city is in a tough spot. Certification can’t be too easy or it’d invite companies to cheat, but it can’t be too hard or it would end up discouraging actual minority- and women- owned companies that are trying to grow their business. The 2005 law also required each agency to make its own M/WBE compliance plans, based off the citywide participation goals and the availability of firms in the industries they needed. Those plans are not public because the law doesn’t require them to be. Oddly enough, it seems the Law Department is the only agency that voluntarily posts its own goals for the M/WBE program on its website. The 2005 law requires SBS to release biannual reports on the progress of agencies that spend more than $5 million in the previous fiscal year. Their annual reports have to include breakdowns of how much money each agency spent in different industries and how much of that money went toward certified companies. SBS has done this report every year, but the law requires SBS to make a determination in that report “as to whether each agency has made substantial progress toward achieving its utilization goals.” SBS doesn’t do that. Instead, its report includes a list of all the good each agency is doing and a general statement that says the city and its agencies have made “substantial progress towards achieving citywide goals.” In fiscal year 2013, many agencies did not hit a single citywide goal. Plus, SBS only has jurisdiction over the 34 mayoral agencies, not all 72 agencies spending city money. So its annual reports are based on less than half of the city’s spending. In 2012, according to numbers from the comptroller’s website, non-mayoral agencies spent $37.7 billion of city money on prime contracts while mayoral agencies under the SBS umbrella spent $23.5 billion. According to the SBS, the city’s M/WBE laws are only applicable to mayoral agencies that fall under the city’s Procurement Policy Board rules—a category that includes 34 mayoral agencies, but not elected officials’ offices and agencies including the School Construction Authority, Department of Education, Department of Investigation, Independent Budget Office, Campaign Finance Board and others. That is not entirely true, according to the Law Department, which contends the law includes elected officials offices and any agency that wasn’t created by a state law. This means the Board of Elections, Department of Education and School Construction Authority are not required to follow the city’s M/WBE law because state law trumps local law, but agencies like the IBO, DOI and Campaign Finance Board are supposed to be hitting M/WBE participation goals. The law states that elected officials, including borough presidents, the public advocate and the comptroller’s office, should monitor their own spending and the speaker of the City Council should monitor the City Council. The law also does not mention who is supposed to monitor spending by the mayor’s office, which for some reason is not considered a mayoral agency. As for the other non-mayoral agencies that were not created by the state, the law does not mention who is supposed to hold these agencies accountable. The M/WBE report card on the comptroller’s website tracks all dollars spent by all 72 agencies on a daily basis, so it is possible to track how these non-mayoral agencies are doing. Some of them are not doing well at all, at least when it comes to prime contracts. In 2013, 0.28 percent of the Business Integrity Commission’s $7.1 million, 0.28 percent of the Department of Investigation’s $36.1 million and .75 percent of the Campaign Finance Board’s $62.3 million went to M/WBE companies. The mayoralty only contracted M/WBEs for $194,568 (or .16 percent) of its $386.4 million spent in 2013 so far, according to the report card. The body that passed the law, the City Council, spent 6.1 percent of its $51.3 million on M/WBEs in 2013 so far. The amended law passed in 2012 was supposed to increase oversight and accountability, though it did not change anything when it comes to oversight of non-mayoral agencies. The quarterly meeting idea was Quinn’s. She referred to it as M/WBEStat, modeled after the NYPD’s CompStat program that requires precinct commanders to meet frequently to talk about their progress fighting crime. Unlike CompStat, though, M/WBEStat does not require agencies to release stats on their progress. The SBS has always been required to create progress reports, but the 2005 law or its update in 2013 does not require SBS to release them to the public. The only other significant compliance change in the amended law is a requirement that if an agency fails to hit its goals, it must create a performance improvement plan, which “shall describe in detail the efforts such agency intends to undertake to increase M/WBE participation.” Again, those plans are not required to be made public. As modest as the changes are, the business community took notice. Some said the change was an acknowledgement of failure by the city. “The best development, it appears, is the implicit acknowledgement by the City that merely demanding more and more ‘compliance’ by the prime contracting community, without the government being more accountable itself for the program success, will not be a sustainable way to continue to proceed,” reads a January 2013 newsletter by Henry L. Goldberg of Goldberg & Connolly, a law firm that has made dealing with M/WBE and DBE regulations for businesses a specialty. The School Construction Authority, a non-mayoral agency that was created by a state law that gave it authority to design its own M/WBE program, is one of the best agencies in the city when it comes to M/WBE participation and is often used as the shining example of how to hit goals. DC 37’s Henry Garrido argues that’s because of more monitoring and more accountability. He said the SCA is able to succeed at hitting M/WBE goals while other agencies fail because they have more staff, thanks to a state law that mandates that 40 percent of SCA’s work be done in-house. “Because of that, they have more city workers policing the [construction managers,]” Garrido says. The SCA is also harsher than any other agency when it comes to second chances. When major companies are caught breaking M/WBE rules, the SBS and MOCS do not ban them from bidding on future projects, but the SCA does. It’s the only individual agency to do this. According to their policy, if a company breaks M/WBE rules, that company is suspended from the SCA’s prequalification list and cannot reapply for five years. The other reason the SCA gives for their success at hitting participation goals is their mentorship program that pairs M/WBE companies with established companies to learn the ins and outs of the industry. The architect of that program, Michael Garner, wrote in an e-mail that historically, “government has failed to achieve M/WBE participation because the focus has only been on outreach and certification” rather than eliminating barriers to entry like bonding, access to capital, effective construction training and bidding on the right size contract. He also wrote that in order for any program to succeed, the government entity has to hold its own staff accountable. “Government must hold agency commissioners and procurement staff accountable for M/WBE inclusion. M/WBE participation must be made a priority because it makes good economic sense. The more sources bidding on your projects, there is a downward pressure on pricing,” Garner wrote. One of the biggest critiques of the original law was its limiting the M/WBE goals to contracts, both prime and subcontract, below $1 million. The amended 2013 law, which went into effect on July 1, removed that cap. The goals were also combined to include prime and subcontracting contracts. These changes to the law will make things a bit easier on companies, as well as city agencies, because any contract amount can count toward hitting the overall goal. So even though some of the goals were lowered, they apply to a larger pool of money. Removing the cap is a great improvement for any M/WBE companies capable of completing contracts above $1 million because for years the law helped reinforce an idea that minority firms can only handle contracts in the thousands, not millions. On January 1, a new class of leadership will take over city government. The three new citywide officers have all been very critical of the Bloomberg administration’s efforts to improve contracts to minority- and women-owned companies. Public Advocate-elect James has arguably been even more critical of the program during her time on the City Council, especially when she chaired the Contracts committee. She introduced legislation to create an advisory board for the M/WBE program. The measure never made it out of committee. But no matter how much the comptroller and public advocate cry foul, the future success or failure of the program will be up to Mayor-elect de Blasio’s administration. Early in the campaign, de Blasio gave the Bloomberg administration an “F” for its M/WBE program when asked to grade it at a forum sponsored by City & State. “Ten years is a long time. We haven’t seen results when it comes to the advancement of M/WBE firms. We haven’t seen a focus on it, up and down the administration,” he said, according to WNYC. While the mayor-elect faces an array of expectations that will be difficult to meet, he does have broad powers to shape the M/WBE program—and perhaps accomplish other goals at the same time. Timothy Bates, a professor of economics emeritus at Wayne State University and senior research fellow Alicia Robb argued in a story in Forbes last year that a way to help unemployment is stronger minority-owned business programs. “A financially stronger MBE community would experience faster growth and create new jobs. Since MBEs are geographically concentrated in minority neighborhoods and often cater to local shoppers, new jobs created would be filled largely by minority employees, extending the benefits into communities plagued by high unemployment and underemployment,” reads the article. Certified business owners who have been critical of the Bloomberg administration’s program want de Blasio to put his weight behind the M/WBE program. “We need to have a mayor that’s really proactive in making M/WBEs a priority in doing business with the city,” says Davis of American Fire Control Inc., adding that he was confident in the next administration. “I see a better horizon,” he says. This series was made possible by Long Island University’s George Polk Investigative Reporting Grant. Click here to return to part 1. Ongoing poor oversight by Empire State Development when it comes to the application process of MWBE’s. In addition, their database has no integrity and is antiquated for business services in 2014. I guess this is what happened when this agency continues to hire political hacks to run this division, 5 Exec Directors in 4 years during Cuomo’s reign. Could we contributed the problem to Alphonso David who just looks at #’s of MWBE and refuses to address the small businesses who can’t apply for gov contractors because they are not a minority. The governor has set an ambitious goal for directing state contracts to businesses owned by women and minorities. But why did it take so long? And who is really benefiting? Hundreds of staffers have been trained, and promised reports are on the way.